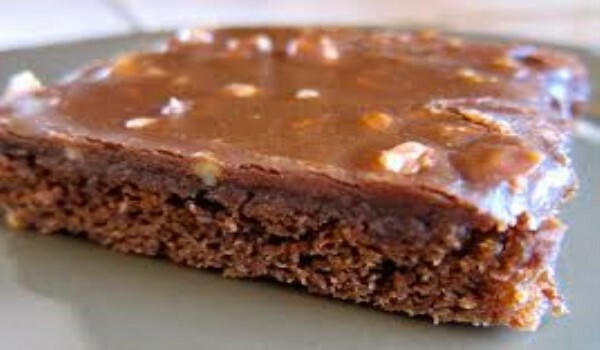 Texas Sheet Cake is a very popular recipe. Learn how to make/prepare Texas Sheet Cake by following this simple & easy recipe. Take butter, water and cocoa in a saucepan and get to a boil. Take off the heat. Mix flour, sugar, baking soda and salt in a bowl. Stir in the cocoa mixture. Beat eggs along with sour cream and vanila extract. Add to the batter. Blend well. Transfer the batter to a buttered 15x10 inch baking pan and bake at 350°F for 20 minutes, or until toothpick test is completed. Put butter, cocoa, and milk in a saucepan and get to a boil. Take off the heat. Mix in confectioners' sugar and nuts. Stir in vanilla extract and pour it over the cake as soon as cake is baked.